Woohoo! 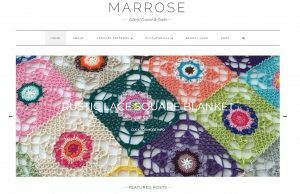 After months of on-and-off work behind the scenes, we are finally ready to show you maRRose’s new look! “We” is my fantastic web guru Frank and I (if you’re ever in need of computer support, his company – MeerWeb – is the place to go). I will not bore you with all the tech-nitty-gritty that was dealt with: it was a lot, and very necessary, but a little bit boring indeed. I love how sleek and visual (colorful!) the homepage is, with endless clickable content, even in the banner-with-slide-show – how cool is that? Another major change is my Etsy-shop now being integrated in the site, very pleased with that as well. I still need to do some sprucing up, but, as with a real move: the house is ready, the boxes with all essentials are unpacked, now is the time to cosy the place up with pictures, flowers and candles. The shop will be the first ‘room’ to work on, so please keep an eye on updates soon. And, there is no need to worry: the blog may look different, you will still find the maRRose-content here that you’ve become to rely on. With a celebration like this comes a little gift, right? 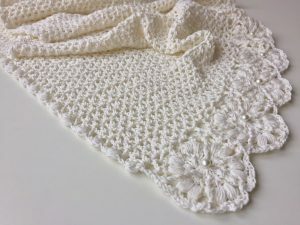 It’s with much pleasure I can present you with yet another free pattern – one of my own very favorites: the brides shawl I designed last summer for CraftKitchen. 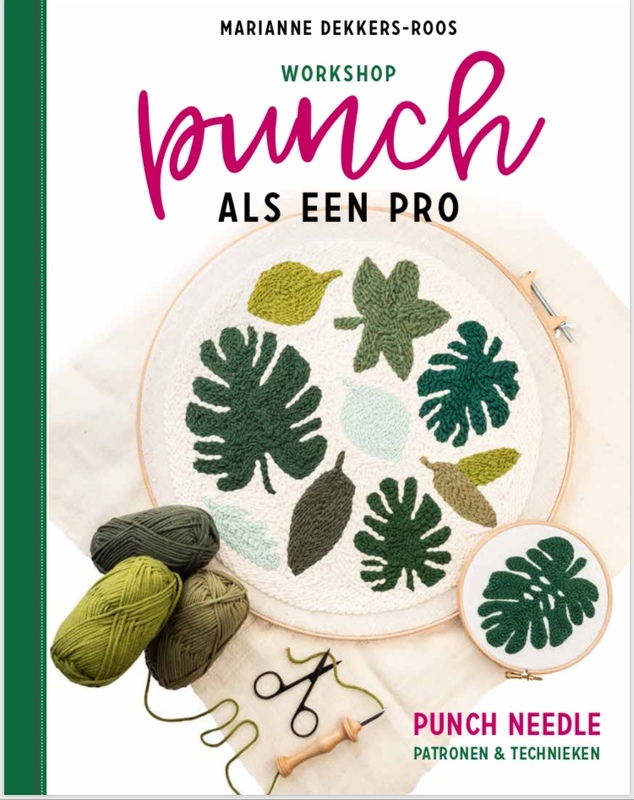 As I said, the Dutch pattern has been ready for quite some time (you can find it here), and I – finally – have the English version (here) ready for you as well…enjoy! You’ll find them both in the “Crochet Pattern/Tutorial”-section of the blog (right here). 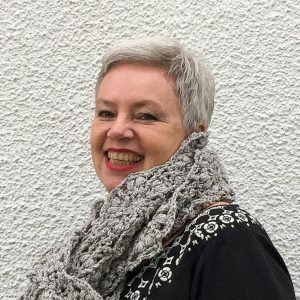 Crocheting, or, better: ‘constructing’, this shawl is easy: first you make all the flower motifs, and connect them in a long/wide strip of flowers, just until you think your shawl has the right width. At that point you will have finished the border of your shawl. 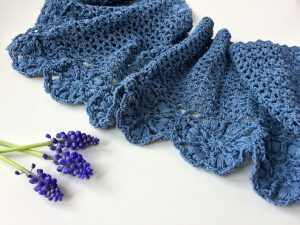 Next up you’ll connect your flower motifs on the top side as well, after which you’ll finish the shawl in a simple but effective “v”-stitch. 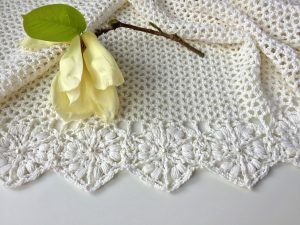 The puff stitches of the flowers will come back in the border of the shawl, thus pulling the design together. 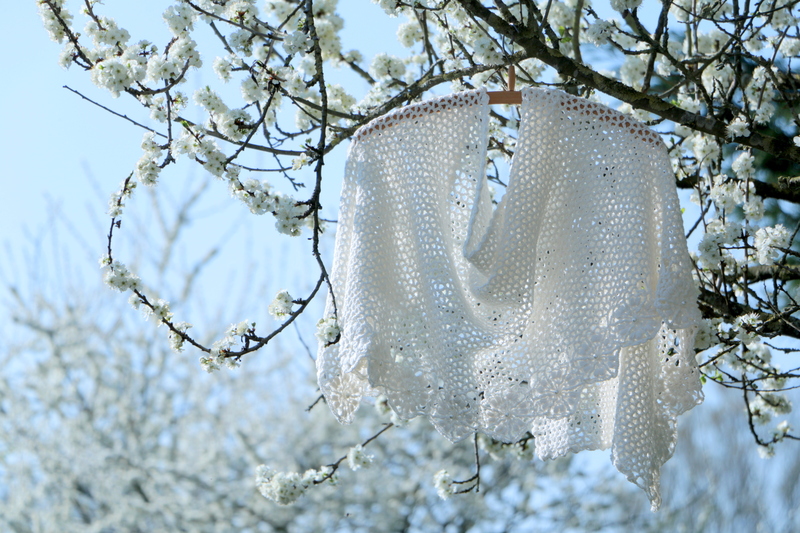 For the brides shawl I hand-sewed a pearl bead in each of the hearts of the flowers for a subtle festive and finishing touch. 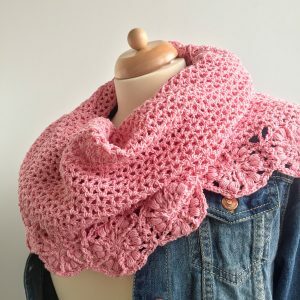 Especially since the remainder of the pattern is just “v”-stitches – a wonderful easy crochet part of this design. * each flower motif has a diameter of about 8 cm (when crocheted with a 3,5 mm/E-4 hook and yarn that qualifies as “fine”). front post single crochet (YouTube-tutorial here): you’ll crochet a single crochet stitch, but will do this by crocheting AROUND the stitch as indicated in the pattern (made in the previous row); put your hook in the space before the stitch that you want to crochet around (from front to back), go around this stitch with your hook, come back to the front through the space on the other side of the stitch (from the back to the front), yarn over, pull up a loop (through the two spaces right and left of the stitch you want to make your front post single crochet around); pull up a loop, draw through 2 loops on hook: front post single crochet stitch made. front post treble crochet (YouTube-tutorial here): yarn over twice, insert your hook in the space before the stitch you want to crochet around (front to back), come back with your hook to the front in the space on the other side of the stitch, yarn over, pull up a loop (four loops on your hook), yarn over and pull yarn through 2 loops on your hook, yarn over and pull through next 2 loops, yarn over and pull through last 2 loops: front post treble crochet stitch made. puff stitch (photo tutorial here, YouTube tutorial here): (1 loop on your hook) in same stitch or space as indicated in the pattern [yarn over hook, insert hook, pull up a loop (to height of – in this case – a double crochet)] 5 times (you’ll have 11 loops on your hook); yarn over and draw through all 11 loops on your hook, chain 1 to lock the puff stitch: puff stitch made. tip: when working IN a puff stitch on the following round/row, you insert your hook under the locking chain stitch). round 4: chain 5 (1st chain counts as 1st sc),* 1 single crochet in puff, chain 4, 1 sc in puff, chain 4, 1 front post single crochet around front post treble made in the previous round, chain 4; repeat from * 5 more times; close this round with a slip stitch in the 1st chain of the beginning-chain-5 – (12 sc – 6 front post sc – 18 chain-4-spaces); fasten off. Crochet rounds 1, 2 and 3 as described under “flower motif 1”; in round 4 we will connect the next flower motifs using the so called “join-as-you-go”-method. “Motif 1” is the motif you are joining your next flower motif to, and the motif you are working on (and that you are in the process of joining to “motif 1”) is referred to as “motif 2”. round 4, “join-as-you-go”: chain 5 (1st chain counts as 1st sc), 1 single crochet in puff, chain 4, 1 single crochet in puff, chain 4, 1 front post single crochet around the front post treble made in the previous round – attention please: we’re going to make the 1st join now – 1 slip stitch in the front post sc of motif 1, chain 2, 1 slip stitch in the chain-4-space of motif 1, chain 2, 1 sc in puff of motif 2, chain 2 , 1 slip stitch in the next chain-4-space of motif 1, chain 2, 1 sc in the next puff of motif 2, chain 2, 1 slip stitch in the next chain-4-space of motif 1, chain 2, 1 front post sc around front post treble of motif 2, slip stitch in corresponding front post sc of motif 1, chain 4; repeat round 4 of flower motif 1 from * 4 more times: close with a slip stitch in the 1st chain of the beginning-chain-5 (one of 6 sides joined); fasten off. 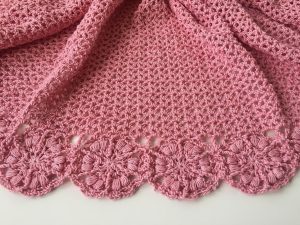 Crochet as many flower motifs as you want (thus deciding the width of your shawl); I crocheted 18 for the brides shawl, 20 for the summer shawl, and 22 for the pink shawl. Join them all on just one side, using the “join-as-you-go”-method. 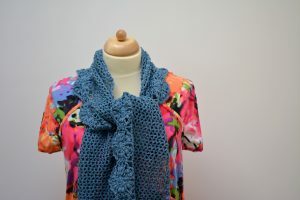 Should you not like this method, you can – of course – join your motifs by crocheting or sewing them together. 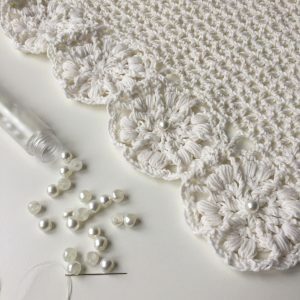 As soon as you’ve reached a width that you are comfortable with, you sew in all your ends; next up is joining your flower motifs along the top side. 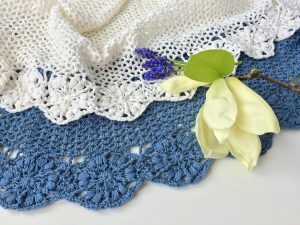 Attach your yarn in a front post single crochet stitch; make sure you count 6 chain-4-spaces between the spot where you’re attaching and the place where 2 flower motifs are connected. This means you’ll want to count back from that very connection to know where exactly to start. row 1: attach your yarn in the front post sc as indicated, chain 4 (counts as 1st treble now and throughout), chain 3, 1 sc in 2nd chain-4-space (counted from 1st treble – which means you skip 1 chain-space), *chain 3 , 1 sc in next chain-space; repeat from * 2 more times; chain 3, skip next chain-space, 1 treble in the (side) of the chain/slip stitch that connects 2 flower motifs (the join made by 2 front post treble stitches – one of each motif); • chain 3, skip next chain-space, 1 sc in next chain-space; chain 3, 1 sc in next chain-space; chain 3, 1 sc in next chain-space, chain 3, 1 sc in next chain-space, chain 3, skip next chain-space, 1 treble in the stitch that connects 2 motifs; repeat from • to the end of this row (ending with a treble). *chain 3 (counts as 1st dc), 1 dc-chain2-1dc (= “v”-stitch) in 1st chain-3-space; •1 dc-chain2-1dc in next chain-3-space; repeat from • to the end of this row (ending with 1 dc in the 1st stitch of the previous row. row 3: *chain 3 (counts as 1st dc), 1 dc-chain2-1dc in 1st chain-2-space; •1 dc-chain2-1dc in next chain-2-space; repeat from • to the end of this row (ending with 1 dc in the 1st stitch of the previous row. Repeat from * until you have reached the height of your shawl, that you think is prettiest; do not fasten off. 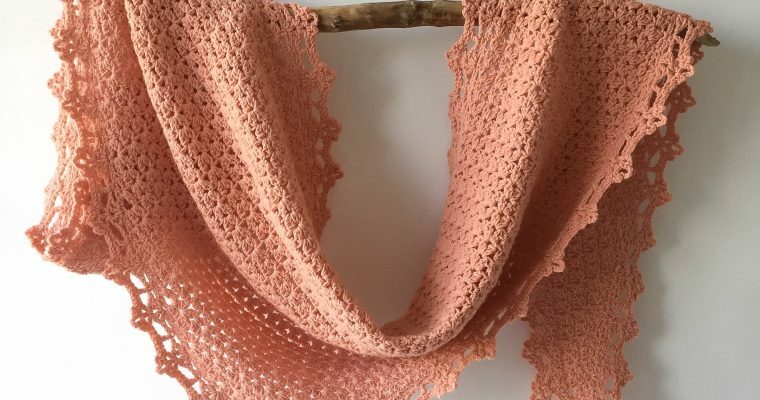 PM: for the brides shawl I crocheted 35 rows (1st row included), for the summer shawl 16, and for the pink shawl 36.
chain 1, turn your work, 1 slip stitch in the 1st chain-2-space (precisely in between 2 dc), 1 puff in same space, *1 slip stitch in next chain-2-space, 1 puff in same space; repeat from * until the end of this row. 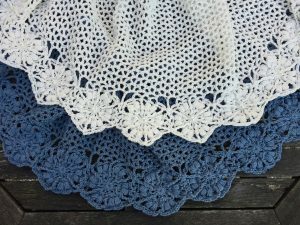 Do not fasten off, we will turn around the corner, and continue crocheting puff stitches along this short side of the shawl. 1 sc in the 1st stitch made in the previous row (the corner stitch), 1 puff in the space made by the side of this same stitch (in fact: you’re crocheting over the side of this stitch); • 1 sc next space, 1 slip stitch+1 puff in next space; repeat from • until you have reached the flower motifs, and end with a slip stitch-puff-slip stitch in the very last space; fasten off. To crochet the border on the other short side of your shawl, you’ll attach your yarn in exactly the same place where you started row 1 of your shawl (= in the front post sc); 1 slip stitch in 1st space, 1 puff in same space, 1 slip stitch in same space; 1 slip stitch + 1 puff in next space; repeat from • until you’ve reached the top of your work again; end this row with a slip stitch in the last space (before the corner) en crochet your last puff; 1 slip stitch in the 1st stitch make in the last row of “v”-stitches; fasten off – sew in all ends. Your shawl will definitely benefit from blocking. Heel erg mooi geworden. Heerlijk licht en helder. Oh darling…I loooove the new look website!!!! So fresh and so very easy to navigate, you put mine to shame now and I really must get a clever person to help me with mine. I love how everything is so neat looking and integrated on yours, especially how your shop is now totally part of your main site. It goes without saying that I love the the Brides Shawl too, I think I may have just the yarn for it in my stash. Thank you SO much!I honestly feel like a kid in a candy store, navigating the new site… and I’m tickled pink that you love it too! Wat een fris nieuw uiterlijk heeft je website/ blog! Ik kan mij voorstellen dat je hier een heerlijk blij gevoel van krijgt ?? En dan dat mooie patroon, wat lief dat je hem deelt! Ik pin hem gelijk! 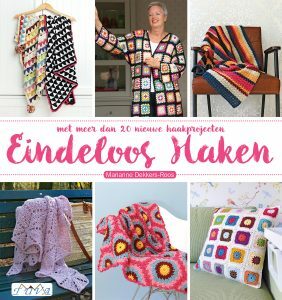 Ah, dánkjewel, Marijke: lief! Ja, gek, hè, maar ik word er inderdaad heerlijk vrolijk van elke keer als ik zelf op de pagina land, haha! Mooi hoor, je website in een nieuw jasje! Zorgt er wel voor dat ik nu nóg meer mijn eigen site aan wil pakken. Het zijn van die dingen: je weet het wel, maar het moet eventjes gebeuren. Dank, Nynke – ik ben er als een kind zo blij mee (en kan je dus van harte aanraden de klus te klaren –> het is het waard). I love the bride shawls. 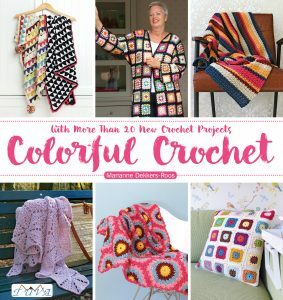 I just wish my crochet was up to it. Hallo Marianne, Is je blog niet in het nederlands? Ik vroeg net is je blog niet in het nederlands? Maar bij de opmerkingen komt te staan engels..
Ik vroeg net is je blog niet in het nederlands? En toen m’n reactie bij de opmerkingen kwam te staan veranderde het woord nederlands in english. Ik bedoel natuurlijk nederlands.